WikiBranding: Handbook for left brainers. I was invited this week to speak to a group of marketing executives at Kimpton Hotels about how to become a more creative thinker. If you're familiar with Kimpton, then you know the company is creative to its core. Michael Depatie, Kimpton's CEO, exhorts employees to "celebrate the tries, even if they don't work." Niki Leondakis, Kimpton's President, supports a culture of creativity by saying "if you're not willing to laugh at yourself and be silly, then we're probably not the company for you." 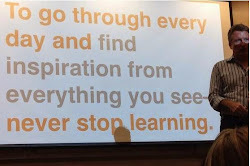 Clearly I was not there to inspire Kimpton to be creative, but rather to provide a framework and useful tools to help teams create bigger ideas more frequently. To me, creativity is not a fluffy art, it is counter-intuitive problem solving. The first step is to recognize and avoid the top three creativity killers: (1) We accept assumptions and solve the wrong problem; (2) We know what we know and narrow the scope of our thinking to ideas that are familiar (perceptual narrowing); (3) We lock down too soon and don't pursue multiple solutions (divergent thinking). Define: Create a ruthlessly well-honed statement of the problem – challenge assumptions; be specific about what you want to achieve. Know: Gather new and relevant information to disrupt preconceptions. Collaborate: Remember that ideas get bigger when they result from the collision of disparate perspectives, experiences and people. Invert: Consider the problem from a radically different perspective to disrupt familiar mental routines and get to new and innovative solutions.